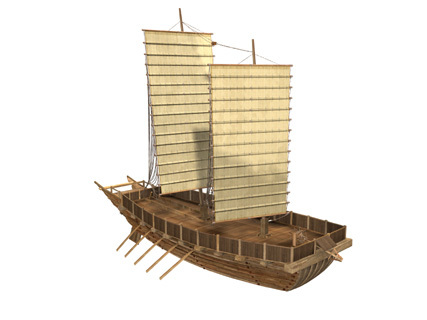 Ancient Korean records confirm Chosun cognizance of Dokdo and exclude the islets from Japan. The following page is the translated inspection report of Ulleungdo written by Korean Inspector named Jang Han Sang in September of 1694. This document is important in that it clearly records Korean cognizance of Dokdo Island hundreds of years before Japan annexed the island. Dokdo island is called Takeshima by Japan and is sometimes referred to as Liancourt Rocks by western nations. First we will get an overview of the Dokdo region by examining some maps. The map below left shows the entire East Sea (Sea of Japan). 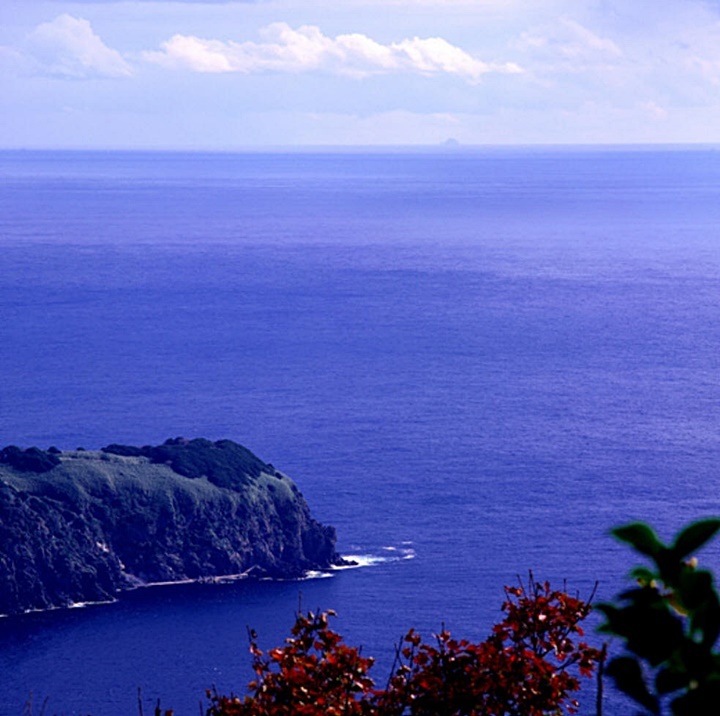 Ulleungdo is located West of Dokdo Island and was historically known from being visible from there. 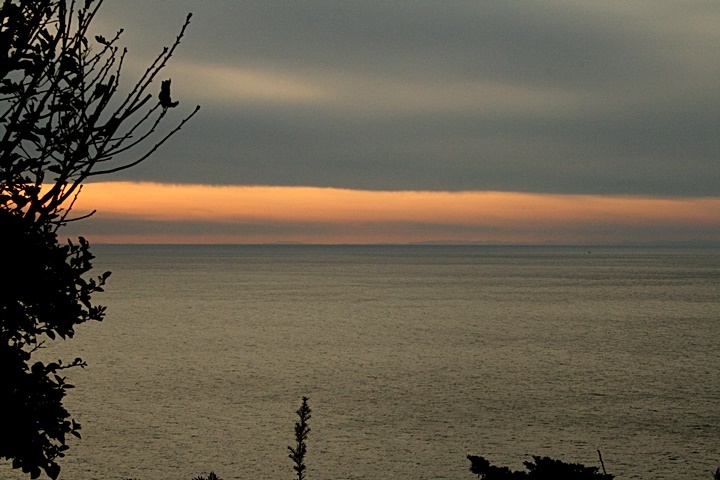 Many historical records also describe Korea being visible from the Ulleungdo – Dokdo region. 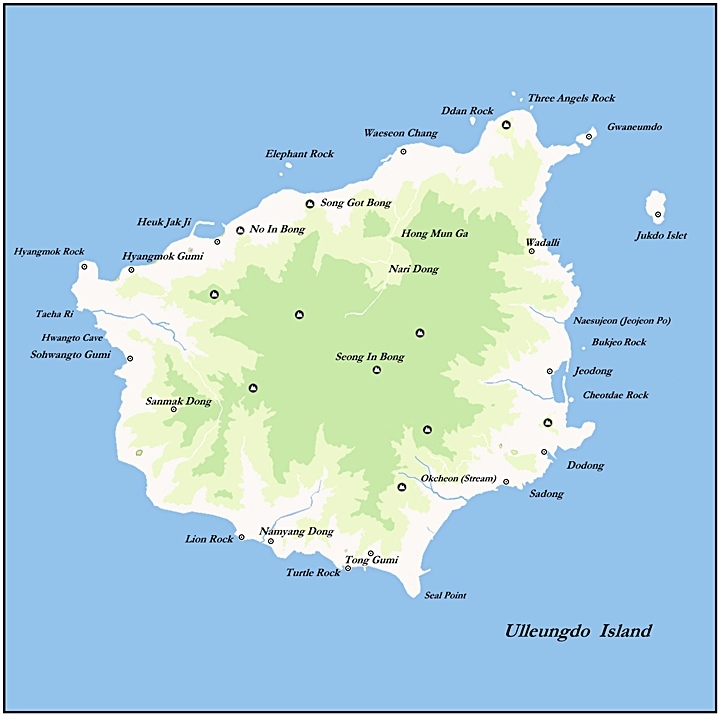 The map below right shows Ulleungdo Island. 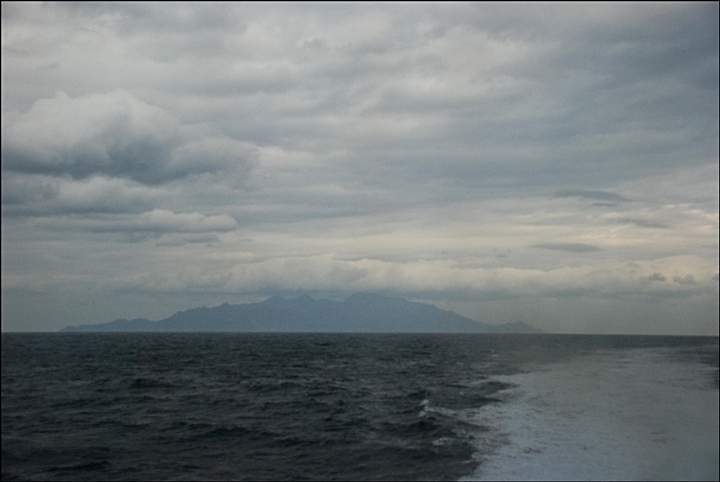 Above left: Even at 60kms distance, in the late dismal afternoon, Chosun’s Ulleungdo island was still visible. At 30kms Ulleungdo towers in the distance. Weather permitting, Koreans could voyage to Ulleungdo and not lose sight of both Korea’s coastal mountains and Ulleungdo Island. Above left. The spectacular mountains and rock formations of Ulleungdo’s North shore have impressed all those who dared voyage to the island. Right. 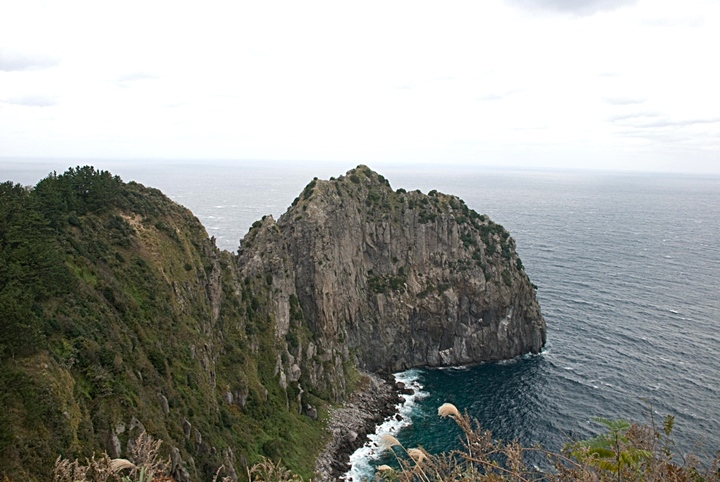 Jukdo Islet from Seommok on Ulleungdo’s northwest shore is a near-vertical slab of rock. Above left: Korea’s Tae-baek Mountain range from Ulleungdo Island much the same as Han Jang San saw it in 1694. 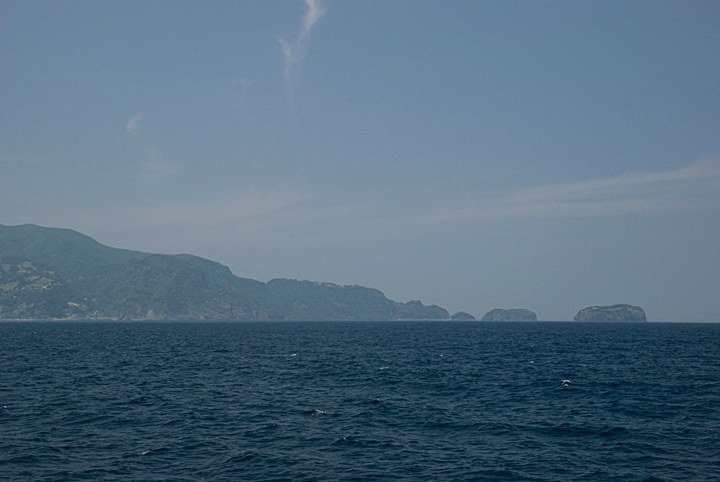 Above right: A photo of Dokdo Island taken from Ulleungdo Island. Above left. 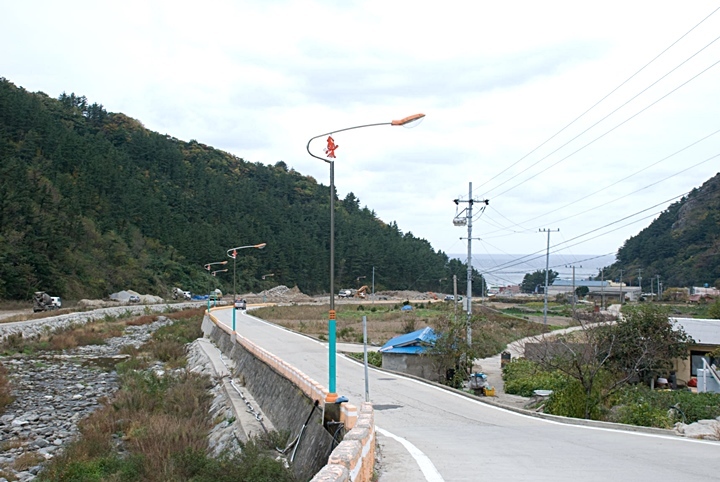 Jang Han Sang’s inspection team most likely set up base on the rocky shores of Ulleungdo’s southeast Sadong area. 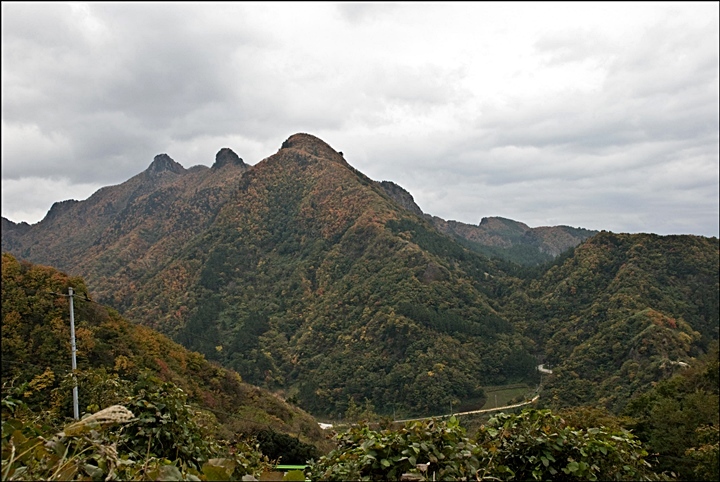 Above right: Ulleungdo’s impressive Three Brother’s Mountains and deep valleys are choked with vines and trees. This made surveying Ulleungdo Island a very difficult task. 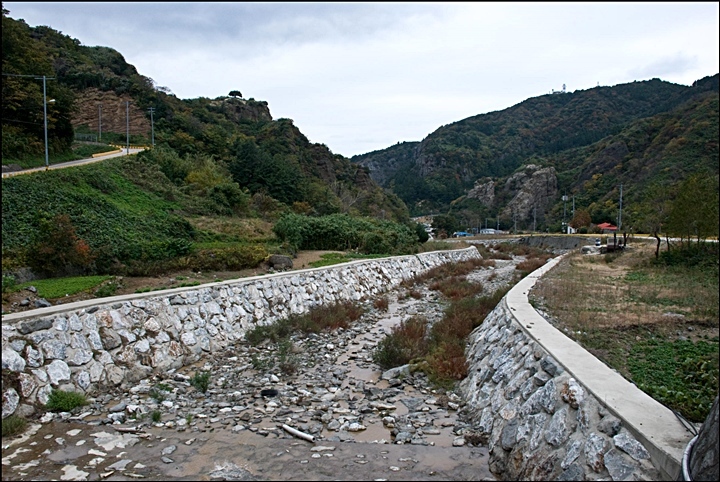 The above photos are of Ulleungdo’s Tae-ha Valley and Tae-ha Stream. This rocky stream meets the ocean on Ulleugdo’s northwest shore. Jang Han Sang wrote this area as 大川流出寬豁 Subsequent maps also marked Tae-ha accordingly. 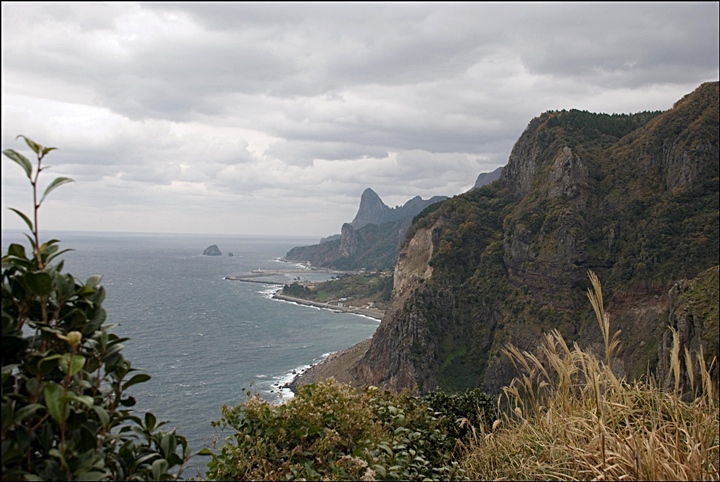 Above left: Hyangmok Rock on Ulleungdo’s northwest shore was near a point where Chosun inspection teams waited for favourable winds to return home. Above right: A photo of Hwangto Cave. 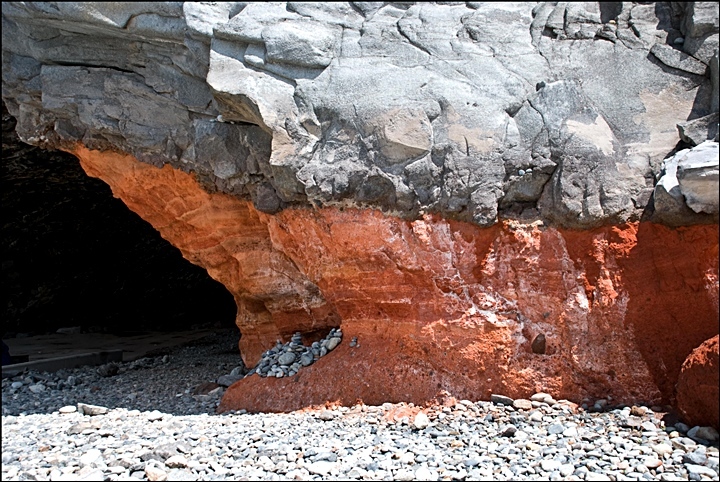 Japanese who voyaged to Chosun’s territory apparently took shelter in Ulleungdo’s caves. “..Judging from this place still intact, once resided by ancient people, it appears it became vacant only about 100 years ago. There is an entrance to the valley, at the stream and upon looking for a strategy to drive away the enemy, this could be a place where one person could defeat a hundred men. 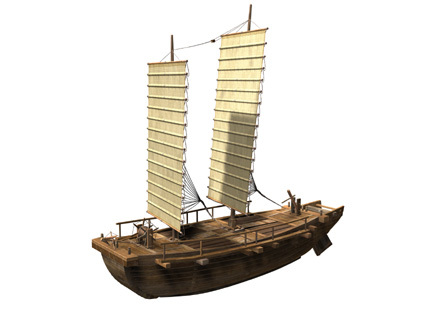 Their boats (Japanese) can’t be grouped together for an extended time. Also if there are any strong winds or waves, even maintaining the boats would be difficult. Climbing on top of the (Ulleungdo’s Seong In Mountain) mountain looking closely, toward their (Japan’s) country, it is dark and distant and no islands caught my eye, thus the distance to their country (Japan) cannot be determined. 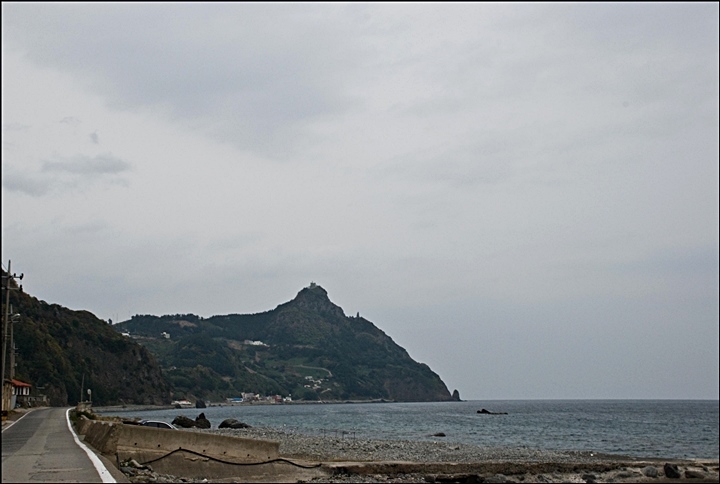 The topography of the island (Ulleungdo) is like a rice cooking pot placed between us (Korea) and them (Japan) and the paths for carrying bamboo were probably made by those people (Japanese) I suppose. So I report this promptly, (names and date follows). From the Ulleungdo Sa-jeok a few important conclusions can be reached about the territorial limits of Korea and Japan prior to the Shogunate’s travel ban on Ulleungdo in 1696. First, it should be noted. Inspector Jang Han Sang (and the Chosun government) regarded Japanese involvement on Ulleungdo as an outright invasion as stated on page one above. Chosun vacant island policy on Ulleungdo was by no means abandonment as some Japanese historians have claimed. Korea clearly considered the Ulleungdo area as Chosun territory. Second, the Ulleungdo Sajeok confirms Dokdo’s visibility from Ulleungdo. This fact was denied by Japanese scholars for decades. A few other records such as the 1714 report (link) and the Black Dragon Fishing report. Even some recent photographs have proven Dokdo’s visibility (link) and laid this argument to rest. 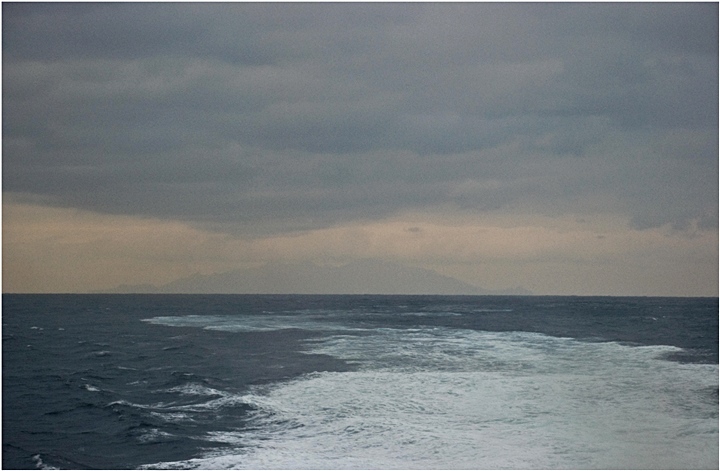 On page six of the Ulleungdo Sajeok, Jang Han Sang recorded seeing Dokdo Island about 300 ri (60 kms) away. He also said the island was less than one-third the size of Ulleungdo. Of course both of his calculations were slightly off. Naturally because Inspector Jang thought Dokdo was bigger he overestimated the distance. It should be noted all historical records of Dokdo albeit Japanese or Korea overestimated the distance between Ulleungdo and Dokdo. In fact Jang Han Sang’s distance estimate is more accurate than Japanese records of the day which estimated Dokdo was 160kms from Ulleungdo (40ri). Another important fact can be ascertained from Jang’s Ulleungdo Sajeok. Although Jang Han Sang saw Dokdo as recorded on page six, he later summarizes his inspection and states. “I saw no Japanese island..” From these statements we can safely conclude Koreans of this era considered Dokdo within Korea’s sphere of influence and excluded from Japanese territory. This was even before Japan’s ‘Shogunate openly declared the Ulleungdo region as Korean territory in 1696. It’s not surprising clear historical records regarding territorial ownership of Dokdo Takeshima are few and far between. After all, Dokdo Island is little more than a collection of large rocks in the middle of an immense sea once considered perilous. However, pooling the historical data from both Japanese and Korean sides a clear picture of Dokdo’s historical ownership emerges. Much like the Korean record above, Japanese documents such as Inbashu’s and Hoki’s response to the Shogunate’s inquiry (link) and the Hachiemon Takeshima Incident (link) also exclude Dokdo from Japan and/or are proof of Korean territorial ownership.